Sorting helps you organize your data into a specific order based on column data. There are two ways to sort a view, a quick sort from the view itself, and a more flexible and persistent sort created in a view. When you sort, you are only rearranging how the data is displayed, not adding or removing content that is displayed in the view. In any view, you can click the header of a column of a list or library and select ascending or descending sort. You can choose any column to sort, but only one column at a time. When you close the list or library, the column will return to its default view order. In SharePoint Online, click View options, click Save view and give the view a name. From the new view, click Edit current view. On the create or edit a view page, scroll down to Sort. In the Sort section, click the First sort by the column drop down and choose a field. This field is one of the many available columns for your list or library, and can be one that is in the view or not. Click Show the items in ascending order or Show the items in descending order. If you want to sort additionally with another column, choose a column in Then sort by the column, and then set the order to sort by. 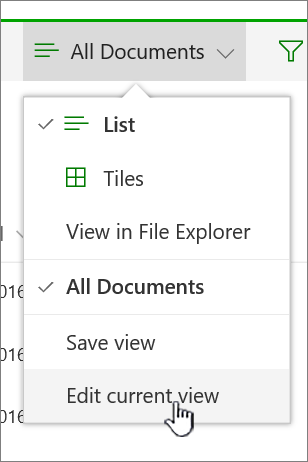 In SharePoint Online, click View options, and then click Edit current view. Scroll down to the Sort section. You can then change settings as outlined in steps 2 through 5 in the Create a sorted view procedure above. You can combine sorting with a filtered and/or a grouped view. Grouping allows you to collapse sorted areas under headers, and filtering can be used to narrow down a large list of items. To see how to group data in a view, see Use grouping to modify a SharePoint view. To learn how to filter data in a view, see Use filtering to modify a SharePoint view.